How can I install a J-Trap for a bathroom sink with limited space? Below is a photo of my installation right now. Every single diagram I've seen has the J-Trap facing down. Is there any way around moving the drainage outlet? It will snake around a lot, but I don't think there's anything wrong with doing that. BTW, since it's visible, I'd suggest getting chrome instead of the plastic. 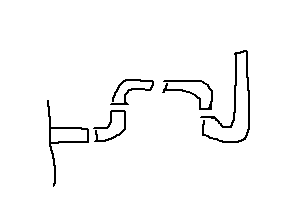 EDIT: As mentioned in the comments below, the solution above is pretty easy, but will result in a more clog-prone drain since the water won't drain as fast, and there are more turns to clog up (and it will not snake easily). The more difficult solution is to open the wall (hope the plumbing is plastic and not iron) and move the sanitary tee higher, and then patch the wall back up. Not the answer you're looking for? Browse other questions tagged plumbing sink drain-waste-vent or ask your own question. 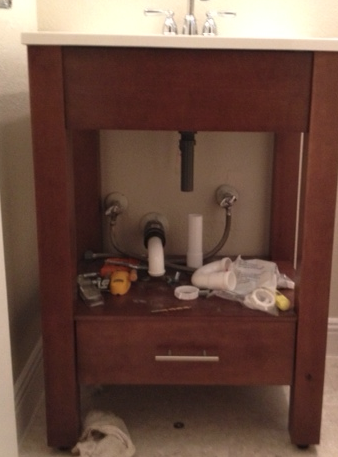 How do I install an in-wall tank (wall-hung toilet) with the stack in the way? How to keep my sink from coming loose? House has no plumbing vent — is this a solution? Can I branch a shower's water supply for laundry sink?